Opening the 20th restaurant in a stretch of Shelby Drive might make investor Anwar Aman seem late to the table. Yet new eateries have sprouted at urban crossroads nationwide. His story tells why. Driving along a row of busy strip shopping centers near Memphis International Airport, Anwar Aman can see the signs. There’s Wendy’s, Fish Fila, Taco Bell and Little Caesars. Then comes Subway, Kentucky Fried Chicken, New China, McDonald’s, Rayford, Kobe, Papa John’s and Burger King. Once he parks his Toyota Camry at 6990 Shelby Drive, Aman can have counted within one mile the road signs of 19 different restaurants. It’s a lot of dining choice, but for Aman, a restaurant investor, not too much choice to warn him off. Enticed by Memphians’ fondness for eating out, Aman and his firm, 600-employee Radiant Group of Collierville, has invested a pile of money in one more roadside dining spot. A tiny Checkers fast food restaurant was set to open Tuesday at 6990 Shelby. Opening the 20th restaurant in this stretch of fast food splendor might make Aman seem late to the table. Yet investors like him eagerly have bellied up. Across the country, new eateries have sprouted at urban crossroads. “We think we can build up to 10 more” Checkers in Greater Memphis, Aman said. Fueling the restaurant building boom across the nation has been Trump tax cuts, investors’ appetite for restaurant profits and the American consumer’s seemingly insatiable demand for convenience. By 2015, U.S. families spent more than half their food budget on restaurant and take-out meals. Analysts figure the typical worker eats out five times each week on average. Whether it is hamburger, pizza, taco, barbecue, cold cuts, fish, steak, chicken, soul, sushi, pasta or a simple salad, more than 100 million restaurant meals are sold daily. Despite the boom, chains that have relied on faded staples or lost touch have buckled. Nashville-based Back Yard Burgers entered bankruptcy reorganization after the half-pound burger left the menu. Other businesses have succeeded, attracted waves of investment money. Looking for sure bets and better returns than stocks and bonds can deliver, investors have backed national chains, acquired franchises or offered expansion money to entrepreneurs. In Memphis, the chains Cook Out and Hopdoddy recently opened locations in the city. Domino’s rolled out a pizza theater-style restaurant in Midtown. And entrepreneurs such as Michael Black are buying franchises offering healthy fare. He plans to open Rising Roll this fall in Poplar Towers in East Memphis. Behind the chains are a long line of investment firms. Sentinel Partner Capital, for example, backs Checkers and Taco Bell. Argonne Capital is the largest franchisee in International House of Pancakes. Axum Capital bought Back Yard Burgers. Roark Capital invested in Arby’s and Jimmy John’s. In Memphis, a pair of well-known investment firms bought notable local barbecue chains — Kemmons Wilson Companies invested in Central Barbecue, Dobbs Equity Partners in Corky’s. Meanwhile, Memphis’ Gus’ Fried Chicken expanded outside the region. And Carlisle Corp. bought the Lyfe Kitchen chain and a string of Wendy’s on the Gulf coast. “It’s never been this hot,” said Chance Carlisle of Memphis-based Carlisle Corp. “I probably get four calls a week from private equity firms.” When big chains like Burger King and Wendy’s began selling off hundreds of corporate-owned locations, entrepreneurs used money from the investors to snap up eateries and begin building more. Carlisle, which announced plans last week to move ahead with the $115 million One Beale apartment and hotel project Downtown, operates 155 Wendy’s restaurants as a franchisee. The firm recently bought 45 Wendy’s near Pensacola, Florida, and has embarked on its biggest construction program in years, building five new restaurants and remodeling a dozen more. In Collierville, Aman didn’t set out to own fast food restaurants. He started with gas stations. Soon he was immersed in America’s fast food craze. It happened after he grew up in Pakistan, moved to Hong Kong, met his Indian wife, and they moved in 1996 in San Antonio, Texas. He enrolled in dental school. An acquaintance in Atlanta, an Amoco dealer, encouraged him to move to Atlanta and work for him. He did and in 1997 branched out, moving to the Memphis area and buying a pair of convenience stores in Collierville, launching Radiant Group. Today the firm owns outright or is in partnership with companies that control more than 80 convenience stores, gas stations and fast food restaurants located between Memphis and Florida. He noticed once when Dunkin Donuts sprouted beside his burger restaurant, his own breakfast sales climbed. It was a lesson, he said. Consumers are drawn to areas where restaurants proliferate. Like a food court in a mall, the competing brands bring crowds. He took the lesson to 6990 Shelby, figured one more restaurant could succeed. 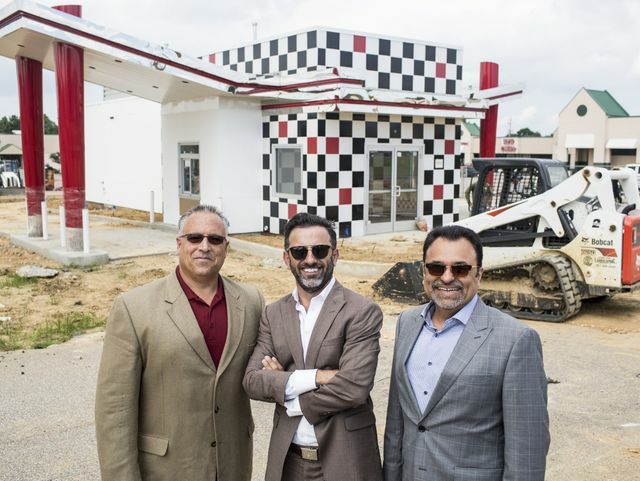 The franchise is owned by Tri-State Restaurants LLC, a Memphis partnership of Radiant and a group of entrepreneurs including restaurateur Buddy Kheraj and former Burger King executive Carlos Sarria. Aiming for fresh $5 meals, Checkers holds down construction costs. Its tiny dining spot offers outdoor patio seats and an indoor walk-up order window, but no indoor tables. The emphasis is on drivers placing and receiving food orders from their car and driving off immediately when served. Less than half the size of a typical Burger King, the restaurant at 6990 Shelby was delivered as four modules containing walls, floor, freezer, counter and grill. A crane hefted the modules off a trailer. Workers put them together. The restaurant contains 1,000 square feet under roof. A single clerk can take orders, fill drinks and reach the cash register with a few steps. Smart safes served by armored cars relieve managers of bank runs. The end result: Fewer workers are needed. Moreover, once the convenience of restaurant delivery services attract residents of Memphis and America the way it has Europeans, Sarria said, Checkers’ drive-through emphasis will lend itself to the new trend. “We think this could be a big part of the future,” he said.